This week has been starting, re-starting, stops, challenges. Nothing went very smoothly. I have been working on the Veteran’s Quilt this week and finished stitching-in-the-ditch all the blocks. I searched for all the items needed to quilt the blocks in the hoop, but my sewing machine refused to calibrate the hoop. I have searched the internet, yahoo groups and called the dealer, there does not appear to be an easy fix, so we have an appointment in Atlanta. A weekday drive means six hours driving. That is not quite how I want to spend my time but is necessary to finish this quilt. I am happy that I was able to keep the blocks smooth, there are no pleats to have to frog (needlework term: rip-it, rip-it) any of the sewing for this issue. I worked on the quilt design for the blocks, one of which I bought specifically for these types of quilts. I am disappointed that I was unable to quilt it this week. I am still working on the design as I have to enlarge it to the block size and then ensure that the design works with the layers and thread I am using. I am trying to have everything ready for my return from Atlanta on Tuesday. I did complete the cabled afghan I worked this week, I just need to gift it in the next week. I decided it was more appropriate for someone in a wheelchair and will give it to a friend whose mother is in a long term care facility. 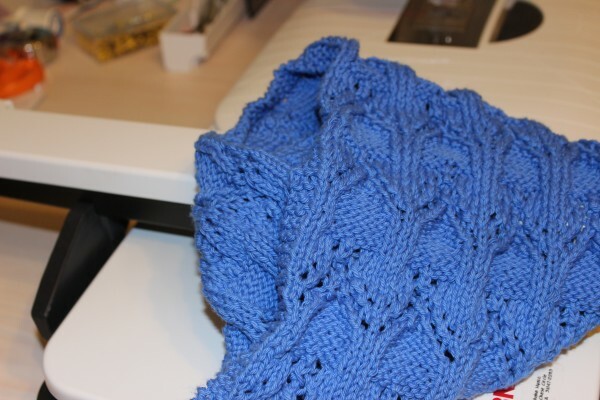 I also, finished the lace project started in class, I used up all the yarn and made it long enough for a cowl. I am signed up for a class in stranded knitting. 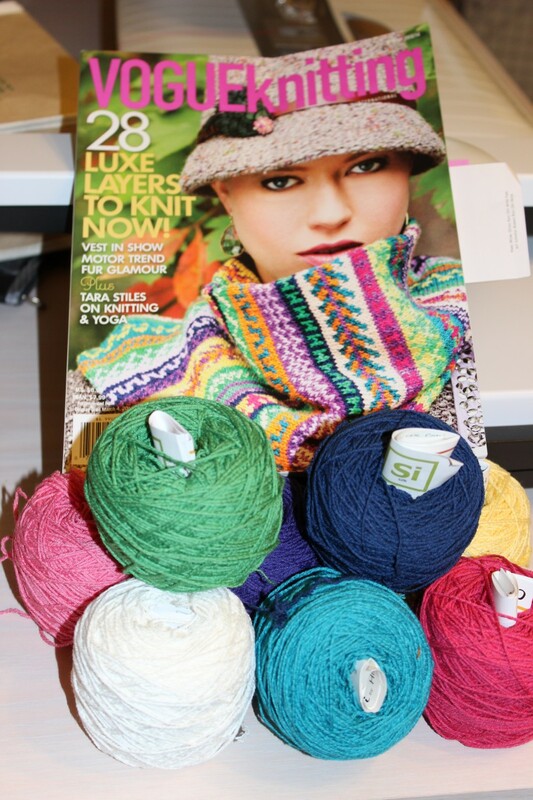 The cover of Winter 2013/2104 Vogue Knitting magazine has a Fair-Isle Cowl I am looking forward to working on, go here http://www.vogueknitting.com/contests/win_a_cover_kit.aspx to win a kit to make one. I enjoy knitting because it is portable, but especially it focuses my brain on something positive and does not leave any room for stressing. When I work a complex pattern it so engages my brain that I have no way of thinking of anything else. When I lose focus, I end up in another frog situation, today at one time I knit the same row seven times, each time rip-it, rip-it was the activity of the moment. These activities have me stay in the moment and leave me feeling content. Maggie and I have been walking at dawn this week. The weather is starting to warm up. The two almond trees in our front yard are starting to blossom. It is great to start your day and appreciate the beauty all around. Sew on, until next week. This entry was posted in Knitting, Sewing and tagged completions., knitting, Veteran's Quilt. Bookmark the permalink.